Reginald John Edwards was called up for military service on the 15th February 1940. 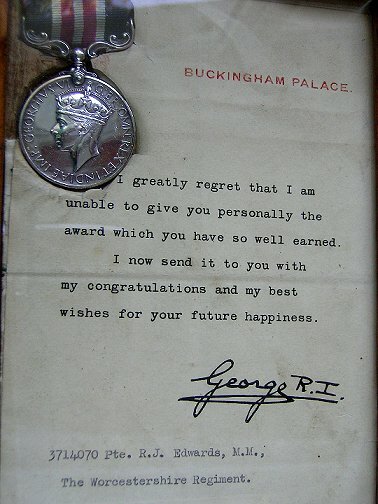 He was posted to the 1st Battalion Worcestershire Regiment who were in Sudan. He served with the Battalion in Eritrea in 1941 and took part in the advance on Keren. At the end of July 1941, he moved with the Battalion to Egypt, disembarking at Port Tewfiq on the 5th August 1941. Then followed a month's intensive training in the canal zone at Ismailia, entraining for Burg el Aarab on the 9th September. Burg el Aarab was some 22 miles down the Matruh coastal road from Alexandria. On the 3rd October 1941 the Battalion moved to the area of the Siwa oasis and later moved was to Giarubub. In mid-December 1941 the Battalion moved by train to Mena, in Egypt. The move was completed on the 24th December. 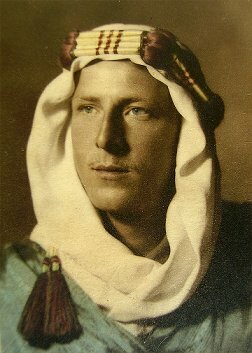 After the Christmas festivities, which were postponed until the 26th December, Private Edwards was able to enjoy the delights of Cairo for a few days. In January 1942, he marched with the 1st Battalion some 400 miles to an area within 30 miles of Tobruk. 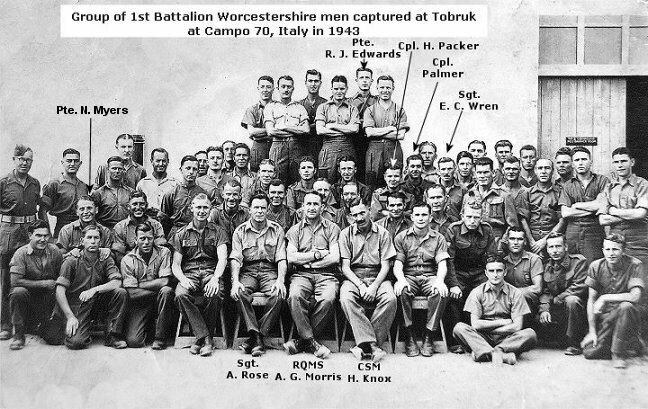 On the 14th February the Battalion was given the task of the Southern defence of Tobruk. By May 1942 the Battalion was at the extreme southern end of the British defences running through Agheila, guarding the left flank which was held by the French Foreign Legion. 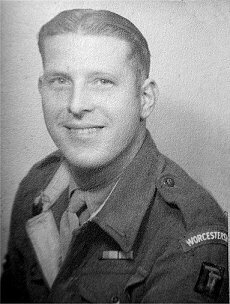 Private Reginald John Edwards M.M. By June 1942 the situation in the desert was critical, Rommel's panzers were now advancing fast. The British army were withdrawing to Tobruk and the 1st Battalion Worcestershire Regiment were ordered to establish a box defence at Point 187, some 6 miles south of Acroma, arriving there at 1800 hours on the 8th June 1942 they took up position. 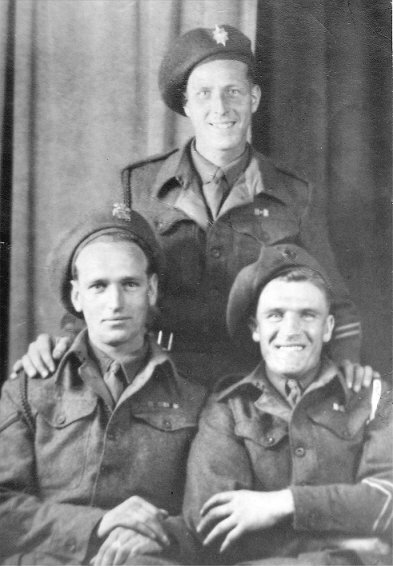 After some heavy fighting throughout June, Private R. J. Edwards and most of the men of the 1st Battalion were captured at Tobruk on the 21st June 1942. He was eventually transported to a POW camp in Italy (Camp 70). He was later transported by rail cattle truck to Chemnitz in Germany and finally ended up at Stalag 4A . Private R. J. Edwards was later awarded the Military Medal for bravery in the field, it is believed for his actions in battle Eritrea (London Gazette 21st February 1946). who were at Glanusk Park Camp at Crickowell, in Breconshire. The 8th Battalion had been there since September 1944 and remained there until the 8th Battalion was disbanded in February 1946. 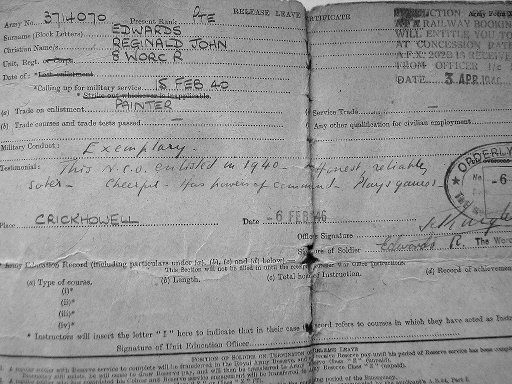 Private R. J. Edwards was released on the 6th February 1946. Interesting story while he was at the POW camp in Italy. The Pope issued four Vatican medals to these prisoners and they were awarded by drawing army numbers from a home made drum Private R. J. Edwards number 3714070 was the first to be drawn. Unfortunately the medal was stolen from him within the first 24hrs!